Will Spotify’s renewed love of ‘free’ make labels at all uncomfortable? Spotify has learned a few lessons about the power of words this week. The company’s well-meaning new content policy – which has seen the likes of R Kelly and XXXTentacion removed from playlists due to what Daniel Ek’s company deems “hateful conduct” in their personal lives – has caused a world of commotion. Spotify’s Global Head of Creator Services, Troy Carter, is said to have been so aggravated by last Thursday’s public announcement of the initiative, he’s quit the company. Sticking on that topic for a second: if Spotify was certain this policy was the way to go, why publicly announce it? If the firm wants to make editorial judgements based on the background of certain acts – and there’s a complex argument to be had over the rights and wrongs of such self-ordained censorship – that’s one thing. But was it a really a smart move, PR-wise, to tell the world and hope to bask in the outcome? Apple might be refusing someone a spot on an internally-controlled playlist right now just for being a detestable dickhead. Apple is also not currently a lightning rod for an emotionally jagged, culturally sensitive, endlessly difficult debate regarding the separation of art from the artist. If you want a taster of the complexity of the problem now faced by Spotify over its ‘hateful conduct’ announcement, consider this. Yesterday, women’s advocacy group UltraViolet applauded Spotify for its actions, before suggesting that, if the platform is going to remove the likes of R Kelly from its playlists, it should also remove other “abusers” (UltraViolet’s choice of word) – such as The Red Hot Chili Peppers, Chris Brown and 6ix9ine. This bore a striking similarity to the response from XXXTentacion’s team to the act’s blackballing by Spotify, in which it was questioned why the rapper was being omitted when the likes of… The Red Hot Chili Peppers, Chris Brown and 6ix9ine remained on the service. Two wildly opposing points of view. Two identical arguments. Spotify getting pummelled in the middle. Talking of Spotify learning lessons about words, the firm is clearly starting to fall back in love with an adjective which, for the past few years, has been kept pretty quiet in its promotional messaging. 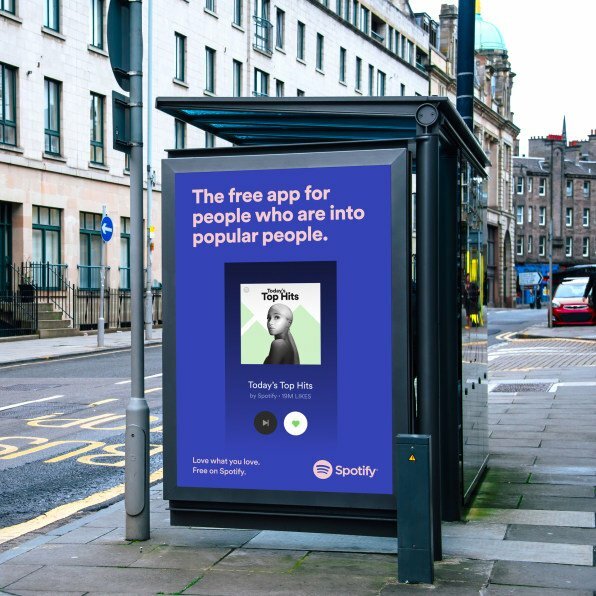 Today (May 15), Spotify has launched what we’re assured is its ‘largest ever’ ad campaign. The marketing blitz centers around Spotify’s new beefed-up mobile free tier which – remember – the firm last month argued would lead to faster adoption of Premium customers. “We’re doing this because we know it will help us drive growth – for the industry, and for creators,” said Chief Product Officer, Gustav Söderström at the grand unveiling in New York on April 24. Creators – and other music rights-holders – will have to make up their own mind if that’s a message they pick up from Spotify’s (very cool) new video ads, below. One thing’s for sure: Spotify isn’t shying away from associating “all the songs you love” with the idea of you… not paying for them. Both of the below video ads realistically ape summer blockbuster-styler movie trailers – one as a horror movie, one as an action movie. Both of them put Spotify’s new ad-supported, interactive mobile tier front and center. And both of them finish with the same phrase.